This is why I can't procrastinate. I forget things. 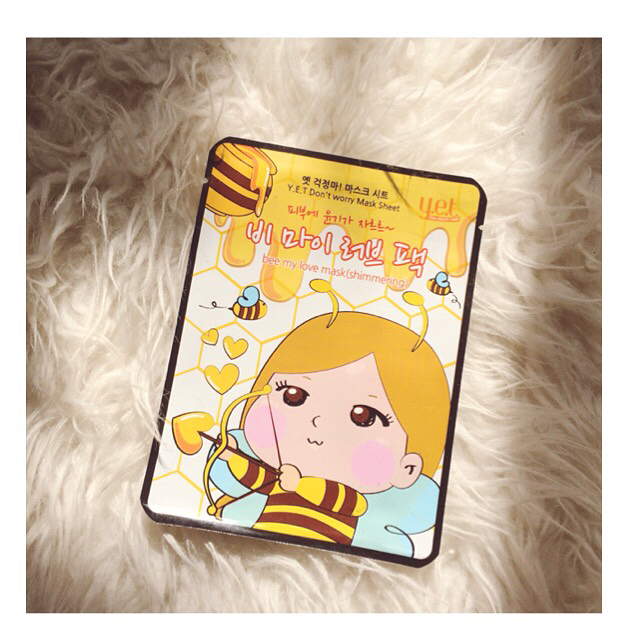 I tried the y.e.t bee my love mask (shimmering) from their Don't worry Mask line a few days ago and almost forgot to review it. I can't read Korean, but looking at the ingredients, most of the extracts targeted hydration (HA, honey), soothing (honey, aloe, green tea and centella asiatica) and brightening (licorice). I'm pretty satisfied that they stated how much honey is in the extract (12mg). Upon opening, it's actually dripping in essences, which smell just like honey (or Scinic honey AIO). The fit was okay-ish. Nothing spectacular or too terrible for my face. The sheet material is common for a cheap sheet mask; cottony and thick. I put it on for about 25mins, although I'm pretty certain you can stretch the duration longer if you want. Verdict: It does not leave any sticky or greasy residue. In fact it does mattify the concoction of essences and serums that I lathered on my skin before using the mask. I don't see much brightening but it definitely deliver ample hydration. Repurchase: yes, not an HG, but decent for daily use.